The development of fixed-dose combinations (FDCs) is becoming increasingly important from a public health perspective. FDCs have advantages when there is an identifiable patient population for whom treatment with a particular combination of actives in a fixed ratio is safe and effective and when all of the actives contribute to the overall therapeutic effect. Such combinations of drugs are particularly useful in the management of chronic diseases. In addition, there can be real clinical benefits in the form of increased efficacy and/or a reduced incidence of adverse effects. Additional advantages of FDCs are potentially lower costs of manufacturing compared to the costs of producing separate products administered concurrently, simpler logistics of distribution and reduced development of resistance in the case of antimicrobials. Above all, FDC therapy reduces pill burden and improves medication compliance. Although, FDCs seem to be ideal under certain pre-defined circumstances, if a dosing adjustment is warranted, there may not be an FDC available in the most appropriate strength for the patient and if an adverse drug reaction occurs from using an FDC, it may be difficult to identify the active ingredient responsible for causing the reaction. Appendix VI of Schedule Y (Drugs & Cosmetics Rules 1945, India) states the requirements for marketing approval of various types of FDCs. The same is further elaborated in this article to provide a detailed guidance including the clinical trial requirements. However, the heterogeneity of the therapeutic field makes it difficult to develop a standard guidance document. The process of informed consent is an ethical mandate for all clinical trials. The principles of ethics in research involving human beings decrees the conduct of a process where the prospective research subjects should be informed of all aspects of the research study and after complete comprehension of all the features involved, should express willingness to be a part of the study, and the same should be duly documented. The consent should be fully informed and autonomous. However, with subject populations that are mostly medically naοve and for whom the whole concept of clinical research and the umpteen terms and concepts associated with it are alien; the true essence of an "informed" and "autonomous" decision is largely lost. The consent process thus gets reduced to mainly a "narration-followed-by-signature" process. Over the last few years, this gap in principles and practices of ethics and consent has been acknowledged and innovative concepts and attempts are being fostered, to make the informed consent process more "ethical". The article discusses the loopholes associated with the informed consent process and the innovative concepts to make it more authentic. Oncology is a highly researched therapeutic area with an ever expanding armamentarium of drugs entering the market. It is unique in how the heterogeneity of tumor, patient and treatment factors is critical in determining outcomes of interventions. When it comes to decision making in the clinic, the practicing physician often seeks answers in populations with obvious deviations from the ideal selected populations included in the pivotal phase III randomized controlled trials (RCTs). While the randomized nature of the RCT ensures its high internal validity by removing bias, their 'controlled' nature casts a doubt on their generalizability to the real world population. It is for this reason that trials done in a naturalistic setting post the marketing authorization of a drug are increasingly required. This article discusses the importance of non interventional drug studies in oncology as an important tool in testing the external validity of controlled trial results and its value in generation of new hypothesis. It also discusses the limitations of such studies while outlining the steps in their effective conduct. Clinical research is a relatively new field in our country that has seen very rapid growth in the last few years. Availability of personnel appropriately trained to the specific requirements of the role they will perform in clinical research is critical for capacity expansion. Our study attempts to understand the specific areas of knowledge and skills that are important for the role of a clinical research associate. The survey was conducted among clinical research professionals from industry and academia who had more than five years of clinical research experience and held important decision making positions in clinical research (stakeholders). The survey questionnaire was designed as a matrix of various clinical research roles on the y-axis and six knowledge modules and eight skills on the x-axis. Respondents were asked to rate the importance of the knowledge /skills to the role of clinical research associates on a three point scale. In discussing results, a significant response was considered to be 50% or greater positive response from the total group. The significant findings were that general, ethics and clinical trial execution modules were rated as critical for the role of clinical research associate. Regulatory module was rated as important for the role. 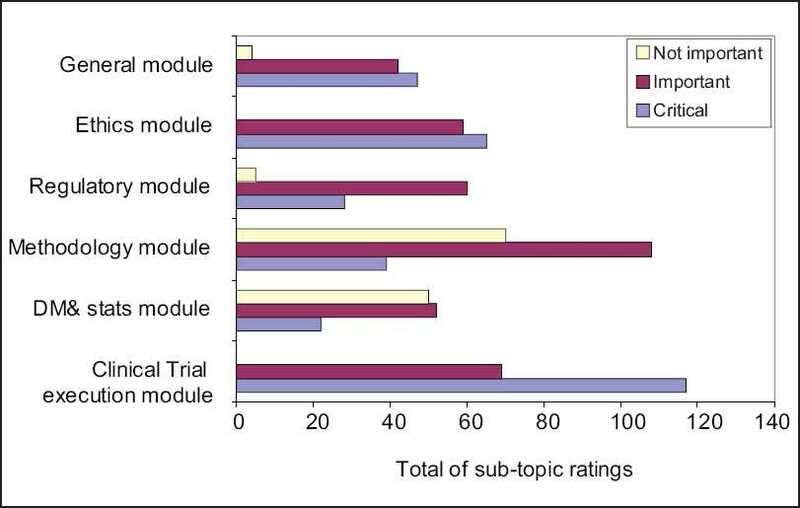 The other significant responses were that three of the sub-topics in the methodology module - framing a research proposal/protocol and experimental design, designing case report forms and EDCs and conducting PK studies - were rated as important and one sub topic in the data management and statistics module was rated as not important. All the skills except leadership skills were rated as critical for the role. The findings of our survey were in general on the lines of expectations of performance of the role. The general, ethics and clinical trial execution modules are critical knowledge areas for the role of a clinical research associate. No clear trends emerged for some of the other modules. Leadership skills were not rated as critical to the role. This kind of a survey gives a good direction when training curriculum has to be designed for specific roles in clinical research. However, there is a need to expand the sample size to fine-tune the knowledge and skills areas. Clinical research institutions have mushroomed in the country, though there is a generalized lack of experienced faculty. These institutes mostly confine themselves to theoretical aspects of clinical research, since there is lack of facilities for practical training. Students passing out of these institutes often find it difficult to get decent jobs and salaries at the entry level in the industry are poor. Poor placements of graduating students become major barriers for attracting quality students to the courses. This in turn affects the quality of people that the industry requires, in order to ensure a high growth rate of the industry. The industry, in addition to facing a severe crunch of high quality professionals, is also suffering from attrition that is a common feature. This attrition stems from, inter alia the industry's demand for experienced people at the entry level. To improve overall standards of professionals entering clinical research, institutes and the industry need to get together and work in close co-operation. The industry and the institutes need to take positive steps if recent trends have to be reversed and clinical research as a whole has to move to a higher level. This article is based on the perceptions of the author, about the problems faced and offers some suggestions. Though these perceptions represent the reality, it is difficult to provide hard evidence that they do so. The growing emphasis on off-site and off-shore clinical data management activities mandates a paramount need for adequate solutions geared toward on-time, quality deliverables. The author has been leading large teams that have been involved in successful global clinical data management endeavors. While each study scenario is unique and has to be approached as such, there are several elements in defining strategy and team structure in global clinical data management that can be applied universally. In this article, key roles, practices, and high-level procedures are laid out as a road map to ensure success with the model. Regulatory inspections are important to evaluate the integrity of the data submitted to health authorities (HAs), protect patient safety, and assess adequacy of site/sponsor quality systems to achieve the same. Inspections generally occur after submission of data for marketing approval of an investigational drug. In recent years, there has been a significant increase in number of inspections by different HAs, including in India. The assessors/inspectors generally do a thorough review of site data before inspections. All aspects of ICH-GCP, site infrastructure, and quality control systems are assessed during the inspection. Findings are discussed during the close out meeting and a detailed inspection report issued afterward, which has to be responded to within 15-30 days with effective Corrective and Preventive Action Plan (CAPA). Protocol noncompliance, inadequate/inaccurate records, inadequate drug accountability, informed consent issues, and adverse event reporting were some of the most common findings observed during recent Food and Drug Administration (FDA) inspections. Drug development is being increasingly globalized and an increased number of patients enrolled in studies submitted as part of applications come from all over the world including India. Because of the steep increase in research activity in the country, inexperienced sites, and more stakeholders, increased efforts will be required to ensure continuous quality and compliance. HAs have also made clear that enforcement will be increased and be swift, aggressive, and effective.